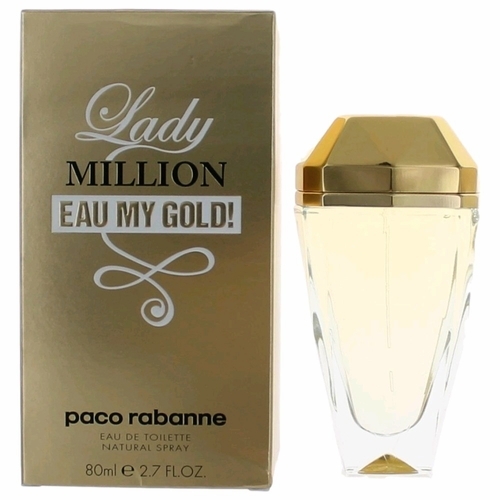 After the Lady Million original fragrance from 2010, and its follow-ups in form of Lady Million Eau de Toilette from the 2012 and Lady Million Absolutely Gold also from 2012, Paco Rabanne is launching its new version called Lady Million Eau My Gold in the spring of 2014, which will replace the Eau de Toilette version on the market. Luxury and hedonism that the original represents have been replaced by inspirations of festive mood and somewhat simpler pleasures. The composition is created with upper notes of mango, neroli, bergamot, mandarin and grapefruit, upon the heart of violet leaf and orange blossom. The base is warm due to notes of musk, amber, sandalwood and cedar.